Silver prices are up more than 2% this morning (Thursday) as volatility in U.S. markets is pushing investors into safe-haven metals. And according to Money Morning Resource Investing Specialist Peter Krauth, a 20-year veteran of the metals and mining market, there's another major catalyst that will keep pushing silver prices even higher for the foreseeable future. At 8:40 a.m., silver prices added 2.1% to trade at $15.60 – the highest level since Oct. 29. Silver is one of the few commodities rallying so far in 2016. Prices are up 9.6% this month and 13% this year. That contrasts oil's year-to-date decline of 28.1%. The reason for the jump in silver prices today is the tanking U.S. stock market. At today's opening, the Dow Jones Industrial Average and S&P 500 fell 1.4% and 1.3%, respectively. Both major indexes are now down 11.4% and 11.9% on the year due to the sinking value of the dollar and fears of a slowing economy. Broader market volatility boosts the price of silver because of its use as a "safe haven." A safe haven is an investment whose value will stay either the same or increase when markets dip. Because the value of silver can withstand volatile conditions, investors typically treat it like insurance rather than an explosive profit opportunity. "I have physical silver," Money Morning Defense & Tech Specialist Michael A. Robinson said last year. "I will not sell that physical silver. It's there for a reason – just like I have insurance on my car, I have insurance in case of a disaster." According to Krauth, silver's application in renewable energy technology will continue to grow this year. You see, silver is an essential component in the photovoltaic (PV) cells of solar panels. When sunlight hits the silicon cells in silver, the reaction forms electrons and creates electricity. Silver's conductivity also enhances the sunlight, which improves the quality of the energy collected. About two-thirds of an ounce of silver are used in every solar panel. That means the silver price will be first in line to benefit from increasing solar power use. Market research firm IHS Inc. (NYSE: IHS) reports global demand for solar panels is expected to grow by about 12% this year. Better yet, Statista projects the renewable energy market to hit a $158.4 billion valuation by 2023. "Solar power is growing quickly, using up a hefty 11% of annually mined silver," Krauth explained. "With the average solar panel containing between 15 to 20 grams each, this industry is having a marked impact on silver demand and that should translate into higher prices." 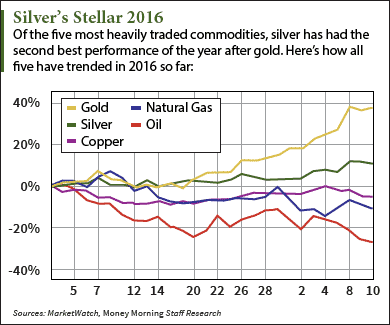 The Bottom Line: Silver prices are soaring this year thanks to pervasive volatility in U.S. markets. But the broader market plunge isn't the only bullish influence on the metal. Silver's critical role in the soon-to-be $158 billion solar market will boost prices through 2016 and beyond. Investor or those who want physical delivery. Silver is moving along with gold and has more practical uses PSLV IS THE silver play.